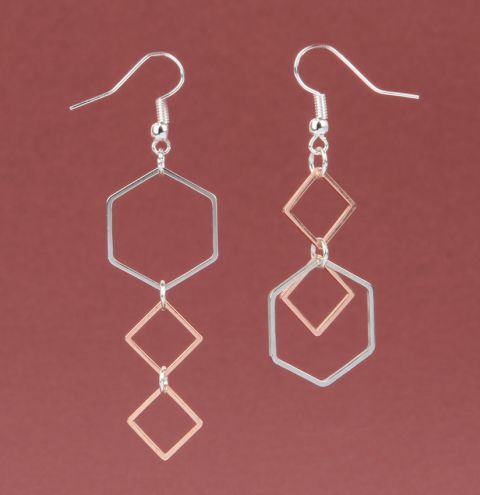 *MINI-MAKE BLOG FEATURE* Create a delicate pair of trending geometric earrings with soldered square and hexagon shapes! These can be made to wear as a matching pair, or asymmetrically for an edgy look! Make yours HERE. Connect your two rose gold squares together with a jump ring, then attach these to the hexagon shape with another jump ring. Take your ear wire and attach the top of the hexagon to it with a jump ring! To create the second style, hold a square shape over a corner of the hexagon and connect them together with a jump ring. Then attach this jump ring to another square, and attach the square to the ear wire.